I mentioned "Sheet pan Dinners" on my instagram recently and I got SOOOOOO many questions that it led me to wonder - is everyone not doing this and WHY NOT???? This is basically 90% of the way I cook these days. It's easy and quick to food prep. Easy to clean because you only dirty up ONE pan. And it's fairly healthy because it's normally very clean eating. Basically you are just cooking your entire dinner on one pan. 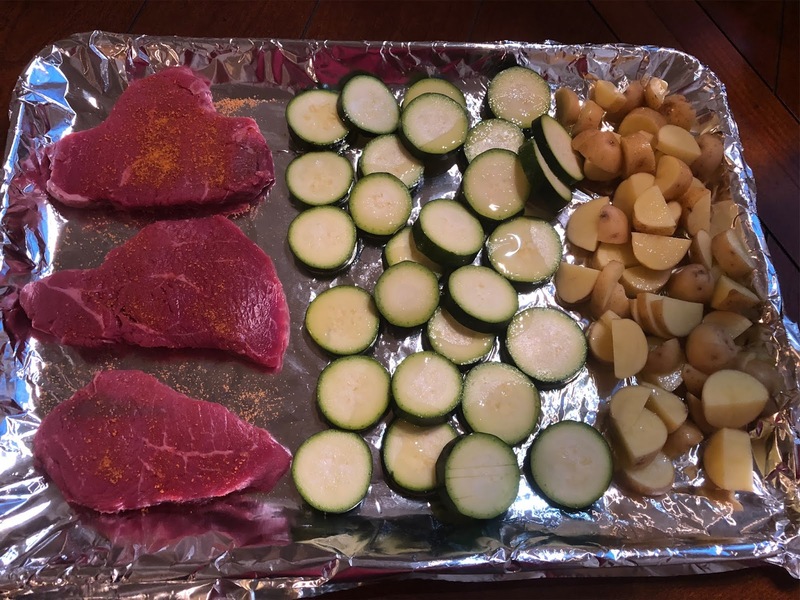 I use a big sheet pan and cover it in foil to cut down on mess even more. And then I just use whatever meat or vegetables and occasionally potatoes that I have on hand. One of our VERY favorites is just hamburger "steaks". I just cook hamburger patties in the oven. I top them with Lawrey's steak sauce and sometimes a slice of cheese at the very end. We all love this. No bun hamburgers. This is pretty much a weekly meal. We love roasted broccoli too. I just top it with olive oil and a little salt. Put it in the oven at 425 for 30 minutes. Here is another variety. I had some small sirloin steaks that once again I just seasoned with Lawrey's. Then zucchini and small yellow potatoes that I topped with Olive oil and salt. Cooked the same as above. This was on instagram. 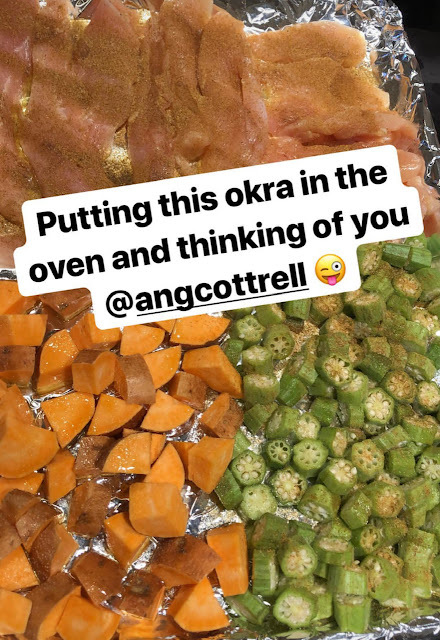 I had small chicken strips that I cooked with cut up okra and sweet potatoes. This is MY FAVORITE WAY EVER to eat okra and sweet potatoes. Just roasted with olive oil and salt. Cook until they are both brown. SO delicious!!!!! This week I made a Shrimp Boil on a sheet pan. Shrimp, small potatoes and corn with a little butter and Old Bay Seasoning. This was delicious!!! Roast at 425 or 450 (depending on your oven) for 25-30 minutes. If you are busy or have little kids or are breathing - this is just an easy way to cook a full dinner!